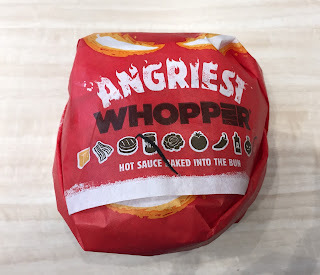 Today, March 31, 2016, Burger King launched a new limited time burger called "Angriest Whopper Sandwich." It's a new version of "Angry Whopper" which was previously sold (but I didn't get a chance to try it), and the second colored bun following A.1. 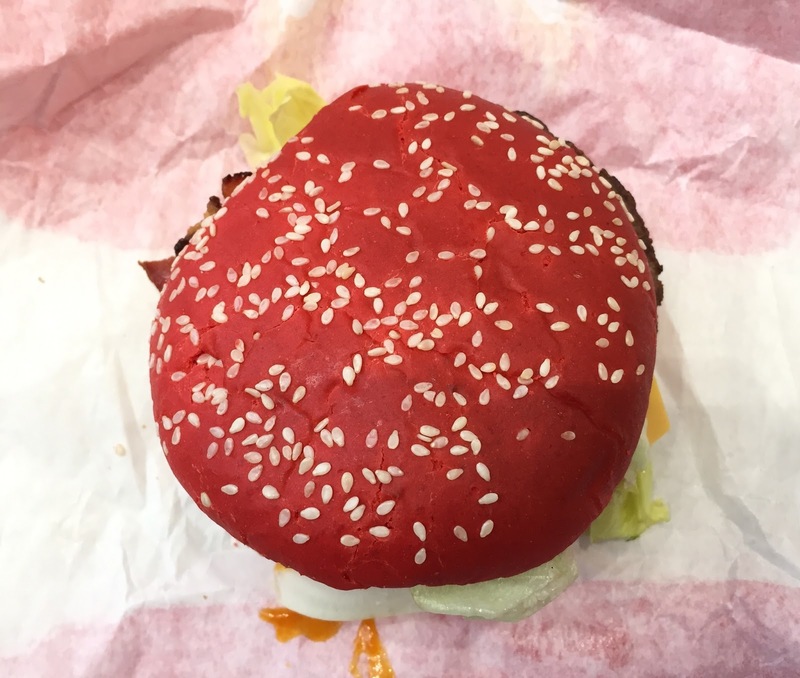 Halloween Whopper. Yesterday, I went to Burger King to try not knowing it's from today because the press release didn't say the launching date, and needless to say they didn't have it and we re-visited today. 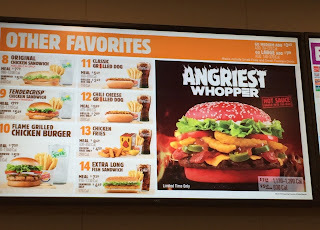 At the branch, they didn't have any poster outside and only the menu monitor was showing the Angriest Whopper Sandwich. The Angriest Whopper consists of a beef patty, bacons, American cheese, iceberg lettuce, tomatoes, angry onion petals, jalapeños, creamy mayonnaise and Spicy Angry Sauce between a red bun that has hot sauce baked in. I'm a mayo-hater, I asked them no mayo. The mayonnaise icon was crossed out. "I survived the Angriest Whopper"
As the image photo, the seeded bun was vivid red. It didn't look like the image but ingredients were piled up in the same order. The bun was lightly toasted, and the iceberg lettuce was chopped while the image contained leafy-ruffled pieces. Under the pile of lettuce and 2 slices of tomatoes, there're angry onion petals, spicy angry sauce, bacons, sliced jalapeños and a slice of American cheese. Since they're not even lukewarm, I guess these were pre-fried and shipped-from-factory, not fried at the branch. And they're not even spicy at all. The bun was supposed to have hot sauce baked in, but I didn't taste any spice and it tasted even as sweet as regular bun. 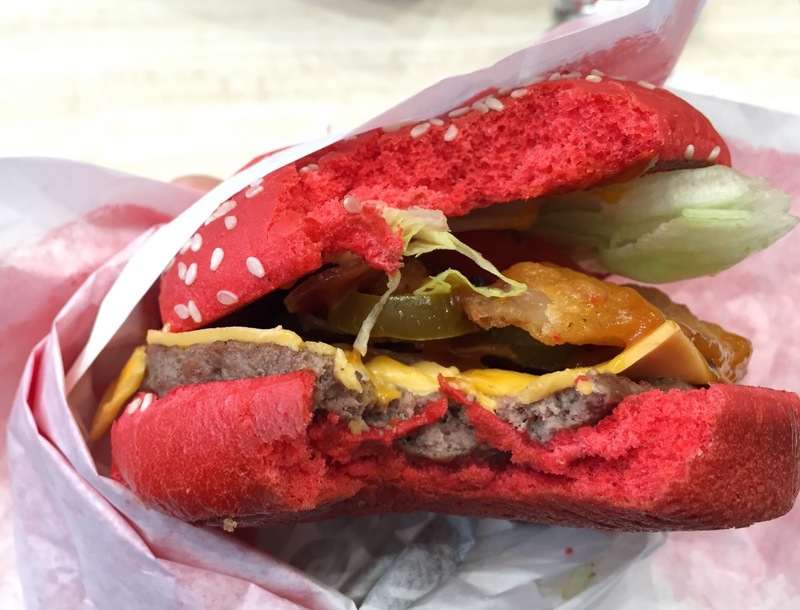 The inside of the bun was brighter red and it looked like red velvet cake. 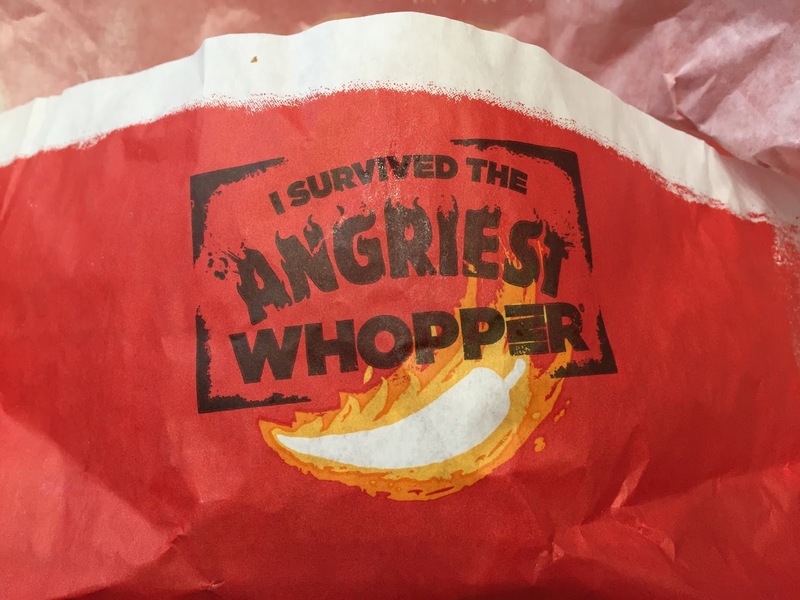 As I didn't get mayonnaise on the Angriest Whopper, the spiciness spread in my mouth without being weakened. The Spicy Angry Sauce tasted like a mix of BBQ sauce and Buffalo sauce because it had some sweetness in the sour and spicy flavor. When I heard the name, I thought it'd be super spicy yet it's only a bit spicy and not even spicy like Tabasco. Fresh lettuce and tomato was adding nice crunchiness and juiciness, and jalapeño slices were pickled and slightly spicier than the Spicy Angry Sauce. Bacons were crunchy and thicker than I thought, and it added smokiness to the Angriest Whopper. The suggest price for this sandwich is 5.49 dollars, as shown on the monitor, but the actual price was 7.69 dollars, which is more expensive than the suggested combo price. They need to update the panel because it's a false information obviously. 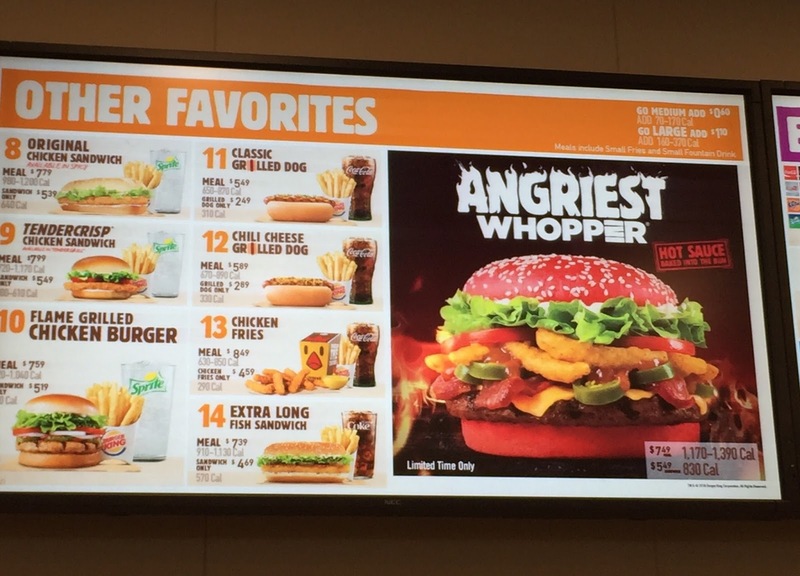 Anyways, I didn't find the Angriest Whopper was worth 7.69 dollars, that is quite pricey. A regular Whopper is 5.19 dollars without cheese, bacons, jalapeños and angry onion petals, which I don't think they would cost 2.50 to add. I'm glad that I've tried but for the level of the spiciness and the price perspective, I won't order it again.